So, you've made up your mind to pursue gallery representation. You have a professional portfolio, your biography, artist statement, and your resume ready to go. Now, how do you decide which galleries to approach? How do you find these galleries? Do you approach only those in your area, or do you go outside the area, or both? Do you approach ALL the galleries in an area or just one? All of theses are good questions. SECOND: Be sure you have your prices in order. I recently saw a chart on suggested prices for emerging to mid-range artists. You normally set your prices, not the gallery, so be sure you have your prices set at a reasonable rate for your skill level. I was in a restaurant here in town the other day that displays art for local artists. 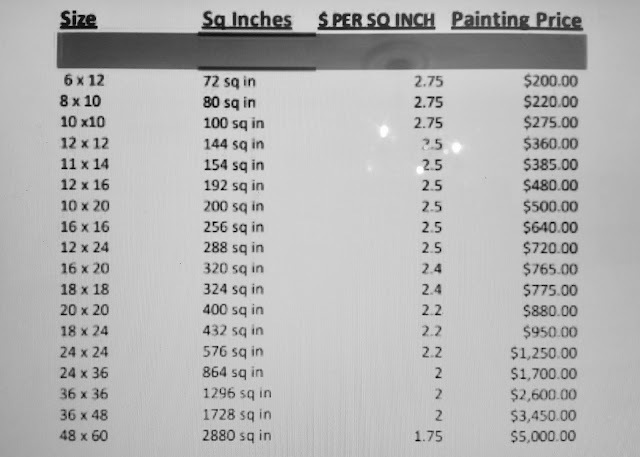 One artist had very high prices on work that was not high quality. Be careful not to do that. I have a photo of the chart below for you to see. To begin your search, set up a spreadsheet of galleries. Start with those in your area first, but list galleries wherever you think you might like to be represented. Then, as you build up a larger inventory of work, you will expand outward to other areas and approach those galleries. I was speaking to another artist recently who only approaches galleries close enough to home to hand deliver her artwork instead of shipping, as proper/safe shipping is very expensive! (NOTE: Styrofoam peanuts settle in shipment, thus exposing artwork to damage during shipment. To ship artwork safely requires a top notch shipping company that specializes in artwork) It has been suggested that you consider places you enjoy traveling to for vacation, etc, or places that would feature your type of art. For instance you wouldn't approach galleries in the southwest with ocean themed art, or Hilton Head with southwestern art. Fill your spreadsheet with galleries! On average, you will be turned down by 50 to 100 galleries before being accepted. Just know this, it's NOT you, it's "just how it is." There are lots of artists looking for representation and far fewer galleries. Don't get discouraged, instead, think of each refusal as getting you that much closer to acceptance! Now, for serious search information. Once you have your spreadsheet done for galleries (this an ongoing process, by the way, regularly updating and researching) then start emailing or mailing them with your information. Very few want walk-ins! They are too busy to talk to you under normal circumstances without an appointment, and they don't appreciated the interruption. Starting with your town or general area, approach ALL galleries that are compatible at the same time! Normally, only one gallery per area will represent you, so if more than one is interested, then you must decide which one to go with. Nice problem to have, right? You could say that the chosen one approached you first, etc. As your body of artwork builds, move outward to other galleries, going as far as you choose while keeping in mind how much work you want to take on as far as delivering artwork. It gets easier to land a new gallery after you land the first one! Galleries like that you are already represented. It is not unusual to be represented by 3 or more galleries, and some well known artists have a long list of galleries representing them. If you have any questions, feel free to email me and I'll try to find the answer for you. (dodsondara@gmail.com) Thanks for looking and keep up the good work!